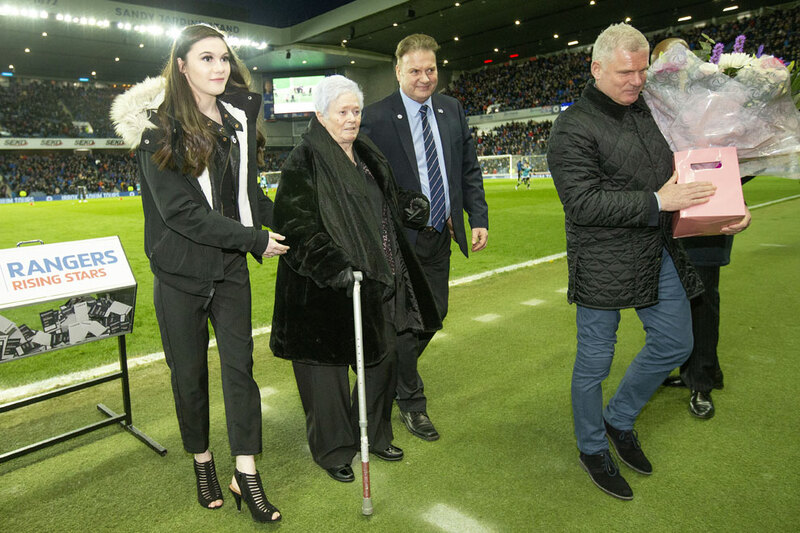 A VERY special guest – Mary ‘Tiny’ Gallacher – took in last night’s match and was given a guard of honour by some of the best players to have ever played for the club. Alongside her were her son John, his wife and daughter Karen. Her grandkids Megan and Josh were also there. They are all very familiar with Ibrox, being part of a dynasty that served Rangers from the 1930s. Tiny started working at the stadium on 18 December 1967 and continued until she retired on 18 December 2018, exactly 51 years later. In 2001 she went to Monte Carlo to receive a special award from UEFA for her loyal service to Rangers and in 2014 she was presented with the John Greig Achievement Award for her contribution to the club. So how did Tiny and her family fit into the Ibrox structure? Well, quite simply, they have been part of a team that worked tirelessly in the background for 80 years. They have rarely shared the adulation enjoyed by players and managers, but every ‘star’ who trod the turf at Ibrox will tell you that the heart of the club lies in its backroom. There you find the people who clean the stadium, cook the meals and wash the jerseys. The ‘family dynasty’ goes back to the late Thirties when Tiny’s grandmother, Margaret (Lindsay) Love, was invited by manager Bill Struth to serve in the new washhouse at Ibrox. There, the players’ shirts, pants and socks were cleaned in the little steamie with its tubs, washboards and mangle. There were no washing machines and dryers then. 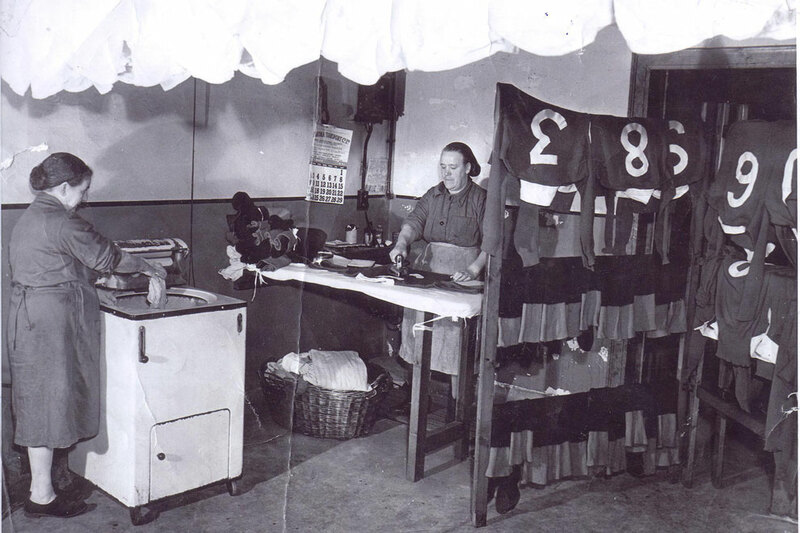 Margaret’s life at Ibrox was one of washing, scrubbing, ironing, darning and sewing. It was hard graft, but her work ensured that the Rangers players were always immaculately turned out. 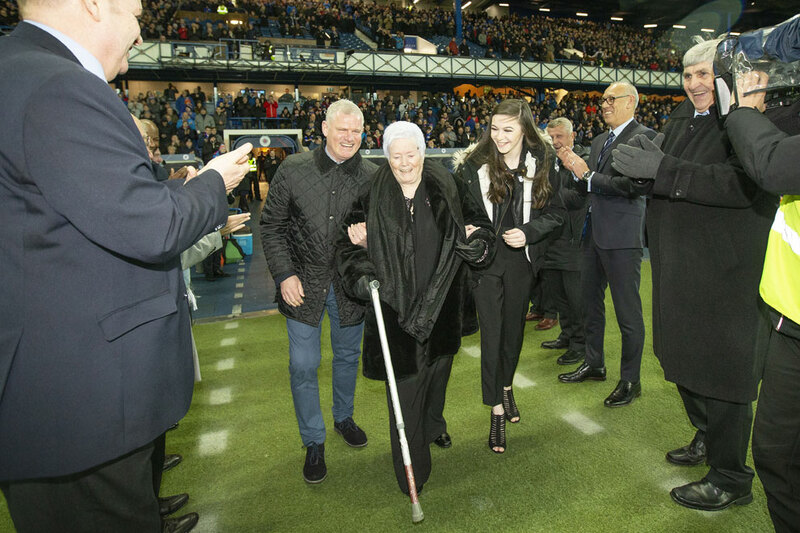 Aside from her labouring, it was an exciting time for Margaret to be at the club and she loved to relate the stories of when the King George VI arrived at Ibrox to formally open the Empire Exhibition in 1938. Of course, it wasn’t all glamour and sometimes she would be asked to go out onto the pitch to help the groundsman with a bit of weeding! 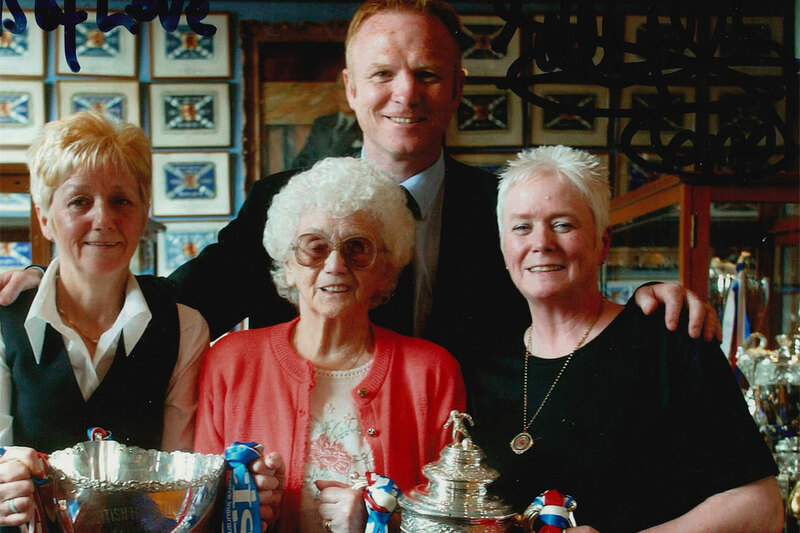 Shortly after Margaret started with Rangers she got her daughter-in-law Lizzie a job at the club. It was the beginning of service that would extend for almost 50 years. Lizzie helped in the washroom, before working in the kitchens, making meals for the players and manager or arranging floral displays in the main guest rooms on matchdays. Through Lizzie, there were other family members who began to work at the stadium shortly afterwards. 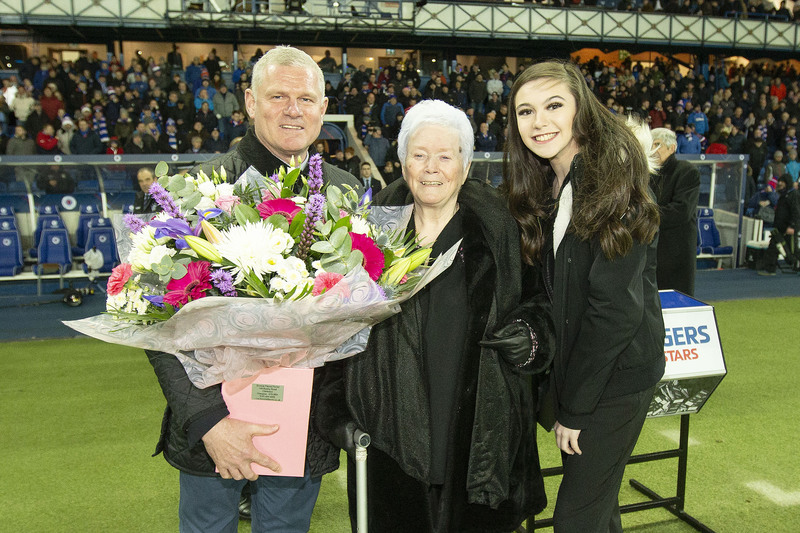 Husband Willie cleaned the stands after matches and he was joined by her mother, Mary (Minnie) Martin, who later went on to operate washing in the kitchens before helping out in the Rangers Pools offices in later years. When Minnie left at 70, she had given the club 26 years of service. Then there was Davie Marshall, Lizzie’s brother-in-law, who became groundsman in 1955, starting off a whole new line of the dynasty, with his sons Davie and Billy also working with the club. Even today, Marion Marshall (Davie’s daughter) works in the ticket office. And there were others such as Jessie, Tiny’s mother-in-law, who also worked in the stands. In fact, just about every female family member worked in the stadium, whilst many of the guys were either on the ground staff or ball boys. My first contact with the family came when I started at Ibrox 33 years ago. By then, Lizzie’s duties had extended to the Trophy Room. Her eyesight had slowly deteriorated and she had become registered blind. She would take the trophies out and clean them meticulously before returning them to the cases – relying on touch and her memory of everything in the cases. I recall once when we were overhauling the room, painting and decorating, and everything had to come out of the glass cases. I catalogued every item and knew to which of the six cases they belonged. However, when I returned the trophies to the cases I slightly adjusted the positioning of some to gain a better balance in the presentation. When Lizzie next went to the case to clean the cups she knew right away they had been moved. ‘The Victory Cup is in the wrong place’, she pointed out, slightly irritated. Tiny found it amusing and I got to know her very well. At that time she worked in the kitchen and she would make me a cup of tea whenever I was in. However, it was her understanding of the club that fascinated me. Both she and Lizzie were fonts of knowledge on the inner-workings of the stadium. They never breached confidentialities, but they were perfect sources for me as I tried to learn more of the machinations of the club and the idiosyncrasies of the characters. By then, Tiny had been joined by her sister Irene, who was always good fun. 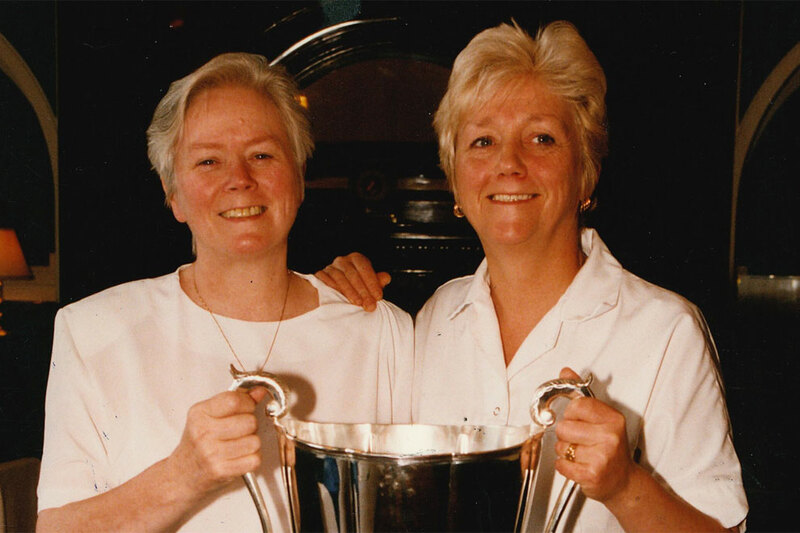 They were engaging people and it is no surprise that invariably when players talk of their times at Ibrox, memories of Lizzie, Tiny and Irene linger. When players leave Rangers their greatest tributes and longest hugs were always reserved for Tiny and Irene. I also got to know Tiny’s husband John, who was barman in the Thornton Suite when it first opened. A nice, quiet man, resplendent in his blue waistcoat. Eventually Tiny’s daughter Karen began working at the stadium, working in the Pools offices. 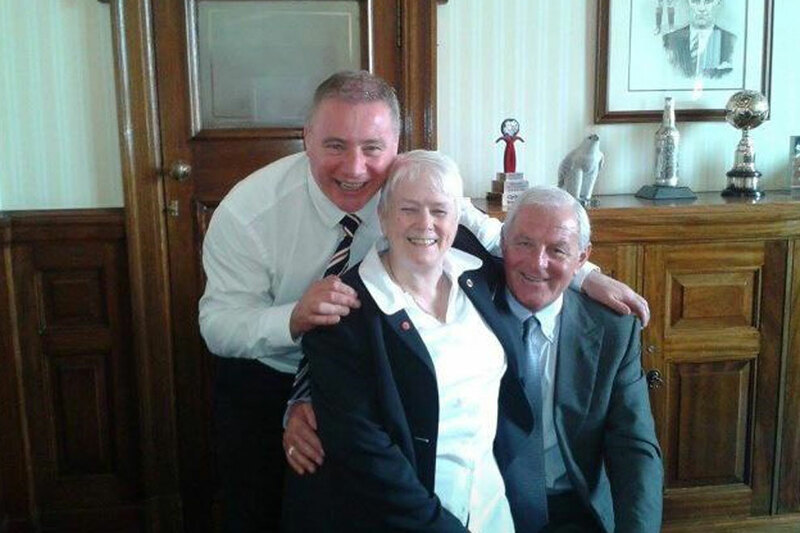 Her son John continues the dynasty, hosting the Ibrox Suite on matchdays and serving as a tour guide. There are many more of the ‘family’ who have served the club and there would not be enough space in this story to cover every one of them. 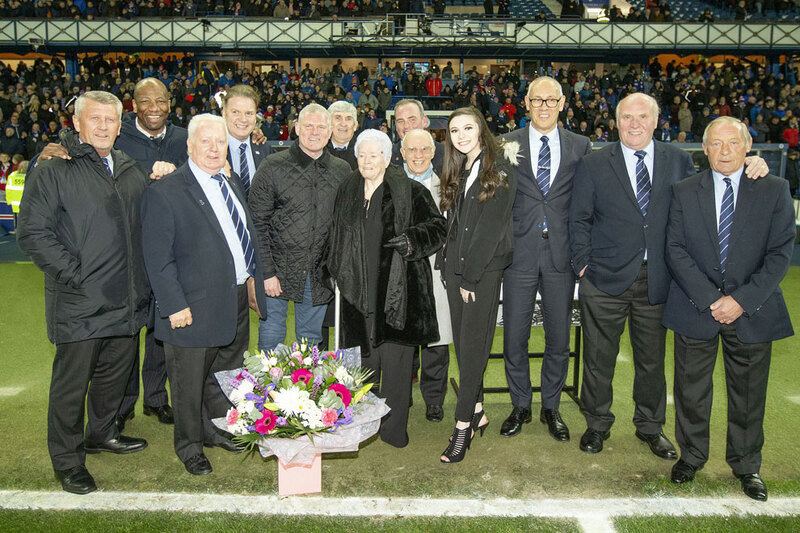 Last night at Ibrox was is about Tiny and offering gratitude for the role she had in the club from the first day she walked into the ground as an employee back in 1967. Sadly, a serious of health setbacks restricted her visits in more recent times and she was hit by the loss of Irene six years ago. No more either, the very special tours she would provide to stadium visitors. A simple job for her really, but no one was better placed for the role. It was almost like showing someone around her home! Last night, it was Tiny’s turn to receive the service that she provided to the club for all these years. It is people like her who make this club so special. I dislike the term ‘family club’, but if it were ever to be truly applied, you need look no further than Tiny and hers. We hope that you had a fabulous day, Tiny. Ibrox is yours once again. Rangers Chairman Dave King: “Through her commitment and love for our club Tiny epitomises everything that is good about Rangers. She has been an ever-present behind the scenes with us for a great number of years and I am sure I can speak for every Rangers supporter in thanking Tiny for her unstinting loyalty. No one will forget this special women and I wish her well in her retirement. 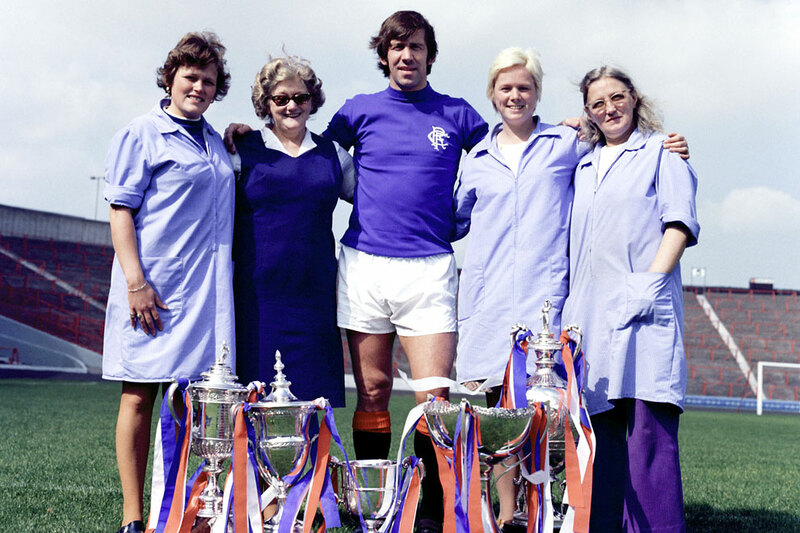 Rangers Honorary Life President John Greig: “Tiny is a devoted Rangers supporter and she showed tremendous loyalty by working for the club for 51 years before she retired in December.